From what I see in the links it looks like the 8-way joystick diagonals can be done with a 74x00 logic chip. It basically runs the directions through a couple of nand gates to get the diagonal pin. If someone can come up with a clever way to do this without needing external power it would be nice. All the intellivision buttons including the side action buttons behave like single throw double pole switches. You should otherwise be able to do it with diodes. There's no pattern to the flashback pinout that I can see. The Intellivision is not a ColecoVision, but on the ColecoVision someone at Edladdin was able to work out a way to steal the 3V for the chip from the console for an adapter that could use a Genesis, CV FB or 7800 controller, but it did not take much to reduce the needed current or voltage (like the equivalent of a controller extension cord or less), so with games with actual 3V trigger threshold or close to it, the controller did not work as it should and they ended up adding a 3V battery on the stick. Maybe using a little higher voltage would help, but It seems like a tricky thing to do. I feel like those Flashback people were just messing with us, or is that randomness not so random on a NOAC. Yup. The description contains a similar type of mild grandiose sensationalism. 3. Thought I was trying to lower the value of his cart by wondering how many others were still out there in parents' basements somewhere. 2. Had no idea what Stella was, but pretended to be "the" expert on this Atari cart. 1. Revealed AA member's confidential bid publically. Astro Invader is included. Sydney Hunter and the shrines of peril and Moonsweeper is missing. Maybe Sydney Hunter and the sacred tribe should be included too, for the guys who don't find the download link. Looking forward to the Colecovision games. I had 55 of the ColecoVision roms in cart or rom form, so should be about 20 new ones, but I also got about 40 emulator-friendly roms with it, so I can travel with them on my laptop. And seems like even 20 roms, 30 with the Inty ones, for about $75-$85 is still a really good deal, like $3/$4 a rom. #4255002 How many Atari Cartridges can I fit in my frunk? Those homebrews look pretty tasty. "Frunk" = front boot of a Tesla? #4251112 Anyone else enjoying Colecovision on the Mega Sg? #4250791 CollectorVision Phoenix Pre-Order is now live! Check out the Collectorvision sub-forum. Played it a bit more. Very impressive. Great gameplay and graphics. Nice port of the game. Facebook ads require a price, so people go around this by adding various numbers. For instance, I've seen $1,234,567 listed as the asking price numerous times. He probably should make it a little more ridiculous, though, than $1234 to avoid confusion. #4245808 New homebrew called "Rocketeer"
That is the impression I have always been under. Jr Pac is the child of pac and ms pac. Baby pac is the love child of ms pac's torrid affair with K.C. Munchkin. Or is it the other way around? I understand why a Master System joystick is WAY easier than a Genesis Joystick. A Master System has 4 pins for each of the 4 directions, one pin for each of 2 buttons, one ground and one voltage pin. It’s discrete. It’s easier than a Genesis where you have to decode a Genesiis to discrete controls and then re-convert it to INTV system. So in theory, could a discrete input controller be easier to wire to your adapter than a SMS controller with a 1+2=3 setup, but instead have 3 independent buttons? I was thinking of a "discrete input fight stick" input. I’m having one made for a lot of video games from Atari to Switch. The fight stick starts natively as a simple electronic signal, and a ground, and that can be send into an encoder. The 3 buttons are separate and native, so maybe, a DIscrete Fight stick adapter could be made with a similar technology as the Master System, since the SMS also a discrete input controller, except we have access to a third button natively instead of having to wire a 1+2=3. Maybe this can be the basis for a 3-independent-button version of a 2600/SMS to INTV adapter. Is a scraping of a paddle as simple as sending a simple binary on or off signal through the paddle pins. If so then you can use a fight stick with discrete inputs wired to an Intellivision converter. You’d have 4 joystick directions, 3 independent buttons, a ground, and a signal. An improvement over the current system is that you have 3 independent buttons instead of a combo of 2 equalling a third. If you can hook an existing INTV controller for the keypad, and "y" in a 2600 booster grip/discrete fight stick, then you have all 3 buttons and 8 of the 16 ways covered. Also a single button 2600 controller can be used for single button INTV games like Burgertime. I’d sign up for 2 of those. If that’s an easy redesign, sign me up. Otherwise, I guess I’ll live with an SMS pad, I have 2 SMS fight sticks, a Beeshu SMS and a Sega SMS stick. So what do you say @grips03, is that an easy enough redesign where you can have 3 independent buttons and have less complicated wiring? If it isn’t I understand. But am I making sense? Now there’s a new use for an Atari Booster grip, and one that actually uses all 3 buttons. He has said several times he's quit making them and not making any more. You really have to jump on things when they are available because they are often gone in a flash never to return. Wonder Boy 3 for the win (I have the remake). 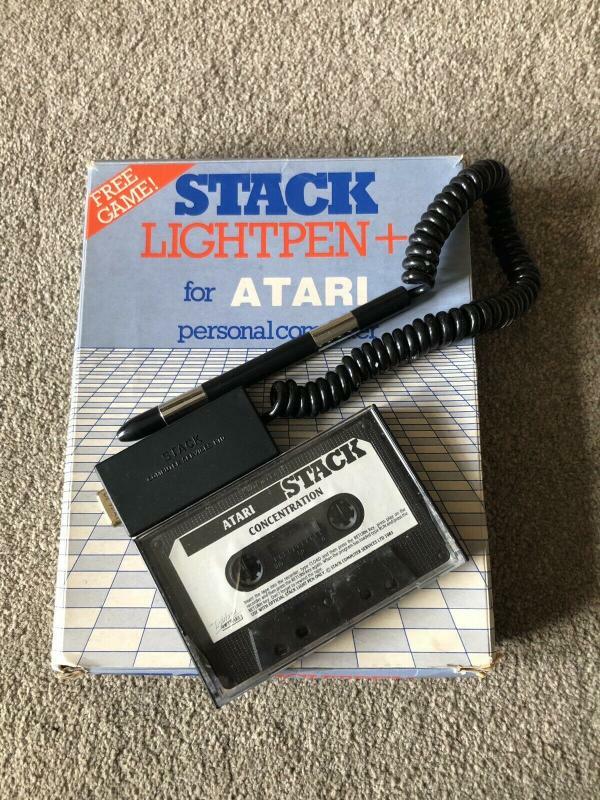 #4240948 What's the latest Atari related thing(s) you've bought on ebay? Rarity 9, according to atarimania. Wish I could find some of the undumped tapes. #4238994 What's the latest Atari related thing(s) you've bought on ebay? an XEGS with no keyboard. No Idea why I thought I needed it! Anyone got a spare XEGS keyboard for sale? I used to see them on eBay. Maybe still there. $30-$40, MyAtari I think.